Imagine waiting for the results of a bone marrow biopsy to find out whether or not you have leukemia. When the anxiety and fear associated with not knowing fill your days, every second counts. Such a scenario spurred pathologists and oncologists involved in the Reliable, Appropriate and Measurable (RAM) Care program at VCU Medical Center to take a critical look at their methods. They wanted to determine how improving the care process from biopsy to results could decrease the wait time. By using research-based best-practice models, RAM Care was able to reduce the time between biopsy and results by 1.4 days, meaning 120,960 fewer seconds of worrying. Led by physicians, RAM Care uses data and research to increase quality by decreasing unwanted variation in care. The program ensures patients receive the right care at the right time in the right place. Through RAM Care, VCU Medical Center combines the value of individualized care with the benefits of evidence-based best practices. “As a leading academic research institution, we have an obligation to our patients to practice to the highest standards, which is what best practice is all about,” said Ron Clark, M.D., chief medical officer of VCU Medical Center. 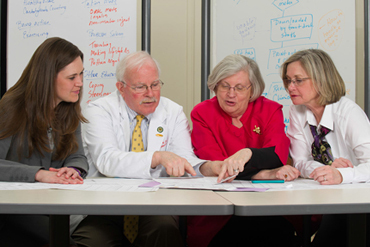 RAM Care provides a formal structure to support the collaboration of physicians and caregivers to create best practices for VCU Medical Center and its patients. By looking at the current care processes and defining care delivery goals, the medical center can establish appropriate measures for consistency in staff training, measuring compliance and patient outcomes. Reducing the care variation helps reduce the medical waste associated with unnecessary or duplicative services. This collaboration also supports the medical center’s efforts to further reduce its already impressively low rate of health care-associated infections. In fact, by using best practices and other preventive strategies, VCU Medical Center has achieved an 86 percent reduction in health care-associated infections since 2003. “RAM Care takes a critical look at care and challenges the teams to think outside the box to determine if we are using the best methods for providing care to our patients,” said Leah Wacksman, M.S.N., R.N., CENP, director of RAM Care. Developing these standards is similar to having a multidisciplinary consultation on every patient, without the additional time and cost. However, reducing variation does not preclude individualized care, and VCU Medical Center physicians are committed to meeting the unique needs of each patient. In its first year, RAM Care reported impressive results demonstrating increased patient satisfaction and quality of care as well as decreased readmissions, retests, errors and costs. The program reduced the need for post-op cervical collar replacements by including collar fitting in the pre-op process, allowing for faster discharge as well as giving patients the opportunity to experience wearing the collar before waking up in it after surgery. The change is estimated to reduce collar waste by 30 percent, resulting in supply cost savings as well. The program also instituted a best practice requiring all outpatient clinics to upload EKG tracings directly into the electronic medical record. This practice resulted in a 93 percent increase in real-time access to the latest results, allowing improved clinical decision-making for all caregivers.